So coming to today's topic of discussion,all of us would know how to use a BB cream or a foundation because we all watch YouTube and would have learned the techniques. But how are some of us able to achieve that flawless look and some still have blemishes seen. Of course, I do not go overboard with foundation and sometimes let my blemishes be seen because it makes me feel more natural but on some days we might feel we need to look flawless for a family function or a wedding.I have an interesting product that I would like to talk about so that we all can achieve a flawless makeup during special occasions or whenever desired without going to parlors. Kryolan Concealer Circle with six different shades for covering small discolorations of the skin. This practical packaging is well suited for the professional use.Dab on with a synthetic brush or sponge for fantastic coverage. Paraffinum Liquidum (Mineral Oil), Paraffin, Hydrogenated Polyisobutene, Octyldodecanol, Candelilla Cera (Euphorbia Cerifera (Candelilla) Wax), Cetyl Palmitate, Tocopherol, Magnesium Myristate, Cera Alba (Beeswax), Petrolatum, Copernicia Cerifera Cera (Copernicia Cerifera (Carnauba) Wax), Oleth-10, Propylene Glycol, BHT, Glyceryl Stearate, Ascorbyl Palmitate, Citric Acid, Linalool, Cinnamyl Alcohol, Alpha-Isomethyl Ionone, Citronellol, Benzyl Salicylate, Benzyl Alcohol, Butylphenyl Methylpropional, Amyl Cinnamal, Coumarin, Hexyl Cinnamal, Geraniol, Benzyl Benzoate, Parfum (Fragrance) and may contain: [+/- Titanium Dioxide CI 77891, Iron Oxides CI 77491, CI 77492, CI 77499, Red 36 CI 12085, Chromium Oxide Greens CI 77288, Yellow 5 Lake CI 19140, Chromium Hydroxide Green CI 77289, Ultramarines CI 77007, Red 7 Lake CI 15850, Carmine CI 75470, Red 40 Lake CI 16035, Yellow 6 Lake CI 15985, Yellow 10 Lake CI 47005] May contain carmine as a color additive. 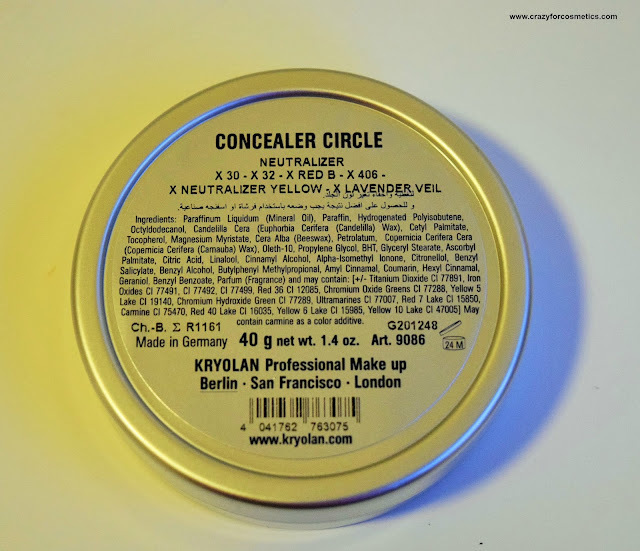 The palette that I am talking about today is the Neutralizer palette that has 6 different shades that can help counteract problems like dark circles(Review of Kryolan Camouflage Cream D 30 here), dullness, redness /pimples and also covers tattoos.This palette was designed according to the color wheel and the concept that opposite colors compliment each other. Shade 1 - Orange : To cover dark circles which are more brownish in color and to brighten up the under eye area. Shade 2 - Lavender : To cover dull spots of patches on the face and also to make the face appear brighter after a tired day. 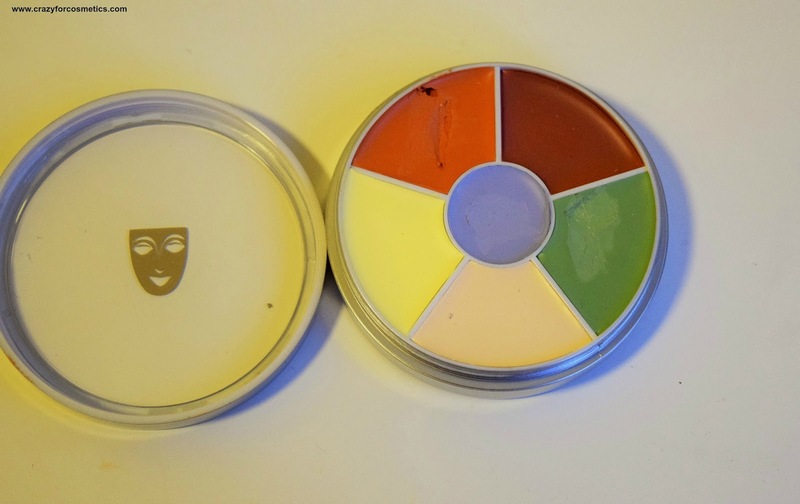 Shade 3 - Green : To counteract redness and to cover up acne on the skin in order to have a flawless finish. Shade 4 - Lime Yellow : To balance out purplish dark circles and it is mostly for fair skin tones who have purple under eye region. Shade 5 - Brown : This shade is to hide the tattoos and the foundation would be applied on top of this to completely cover up the tattoo. Shade 6 - Beige : To conceal yellowish or sallow skin which one may experience due to lack of sleep. 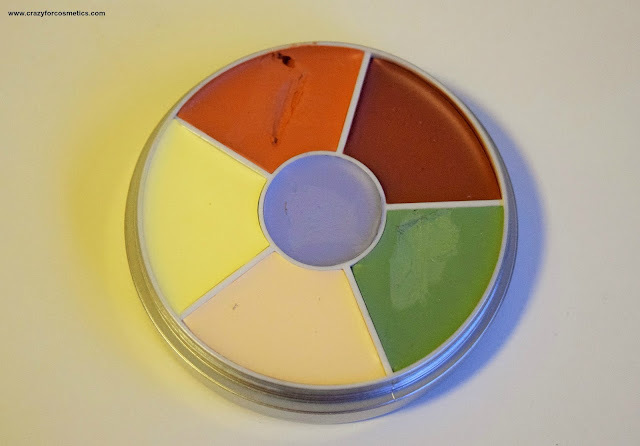 The product is extremely creamy, blends in beautifully on the skin and stays put for about 7 hours. A small dot of product is just enough to cover blemishes and the palette would come a long way. 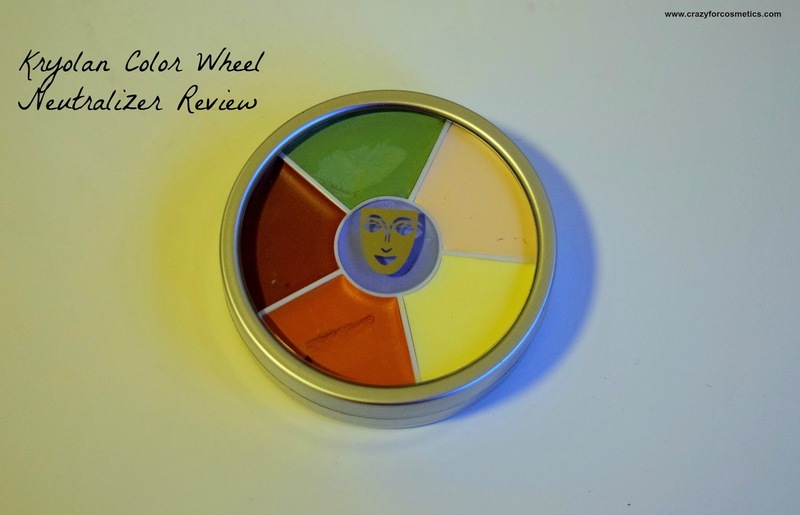 By looking at someone's skin, we have to determine the colors from the color wheel that we need to use on them and then use tiny brushes to apply the product on the blemishes. You can then follow it up with your foundation and use a beauty blender to blend everything smoothly.These color corrections come into use when we need a flawless finish especially during parties, weddings etc.It is not enough for a makeup artist to just apply foundation on a person but it is also important to cover their skin issues. How to conceal dark circles & acne marks ? Highly recommended for Makeup Artists.